The Suncourt EntreeAir door frame fan efficiently circulates warm or cool air from one room to another. This energy and money saving fan is affordable and easy-to-use. Available in pearl and brown. 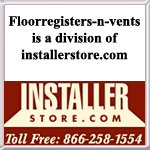 Boost the airflow of your floor registers by 80% with the Suncourt register booster. The Equalizer EQ2 increases airflow in rooms that are too hot or too cold. Fits any floor register up to a size 6 x 12. Suncourt Flush Fit Register Booster properly controls temperatures in rooms that are normally too hot or too cold. Increase register airflow with this affordable register booster. Fits a 4x10 floor register (hole opening in the floor). Available in pearl and brown. Suncourt adaptor plate allows you to use the Flush Fit Register Booster (sold separately) in wall/floor opening sizes of 4x12, 6x10 and 6x12. This Suncourt adaptor plate enables you to use the energy efficient register booster for larger floor and wall opening sizes. Sold in pearl and brown. Efficiently move air from room to room with the Suncourt ThruWall Pro Fan. The quiet room to room fan works great in rooms with pellet stoves, wood stoves, fireplaces and standard heating and cooling systems. The Suncourt ThruWall Pro Fan must be hard wired into your homes electricity. Balance temperatures in adjoining rooms with the Suncourt ThruWall Fan. This room to room fan quietly and efficiently distributes cool air in the summer and warm air in the winter. The temperature control fan is available in white.